The man who brought us Innumeracy and touted the benefits of mathematical thinking begins his ‘anti-memoir’ by conveying concerns and questions we should have about biographies… or our own lives. In her new book, Troublemaker, written with Rebecca Paley, Remini interweaves stories of her personal and professional life with her history in and growing doubts about Scientology. 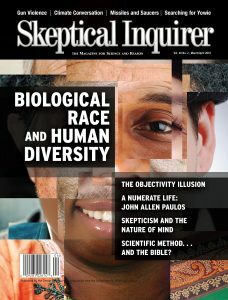 Is biological race a mere myth or a troublesome fact better left unexplored? Does the Scientific Method Have Biblical Origins?